Since 1972, NB Golf has been the premier source for personal and utility club cars. 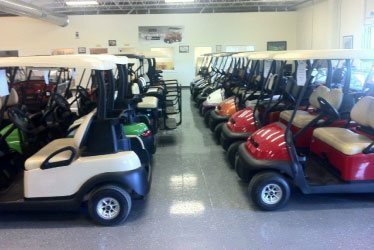 NB Golf Cars has been an acclaimed source for Club Car golf cars since 1972. Since expanding from our original location in Hendricks, MN, into Des Moines, IA, and Sioux Falls, SD, we are now the Upper Midwest’s leading distributor of the premier Club Car golf cars. Here are links to the many Midwest golf courses that let you ride in Club Car comfort and style while you golf. However, golf carts aren't just for the golf course anymore! They are very useful at the lake or on the farm, and very convenient and fun to use at the campground! We are loyal to our products, as Club Car continues to be an innovation leader and the world’s largest manufacturer of small-wheel, zero-emissions electric vehicles. With over 50 years of experience in producing small vehicles, Club Car has built a reputation for creating the best, longest lasting utility and transportation vehicles in the world. We take it one step further here at NB Golf. We have many different styles to choose from at all three locations and will customize a car that fits your personality and needs. We put quality and expertise into every NB Golf Car design - custom logos, custom paint, custom wraps designed for you, custom seats, hundreds of accessories - the possibilities are endless for your dream car. Look at some of the cars that we've built for other customers to get ideas for your own custom golf car! At NB Golf, we specialize in customer service. We have a long-standing, value-driven tradition of caring for our customers throughout the life of their Club Car. We have Certified Club Car technicians to keep your car running smooth. In 2016, our technicians will come to your location to service your Club Car for your convenience. Since the beginning, we have strived to meet the needs of all golfers and provide them with the best from Club Car. 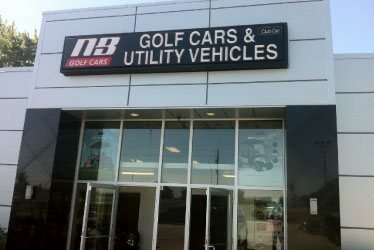 From personal cars, rental cars, short or long term leased cars, to specialty units, let NB Golf Cars help you find or build the vehicle that matches your lifestyle. What does it mean to be "NB Certified"? All cars are throughly checked out by our Certified ClubCar Mechanics All NB Certified cars have a 30 day warranty that can be upgraded to 3 years. All NB Locations. Only $150!!!! Works on all brands of golf cars. Great for the Lake. Take it anywhere you go! Our EBAY store is doing well! Add us as a favorite seller and book our store page to watch for any special deals!